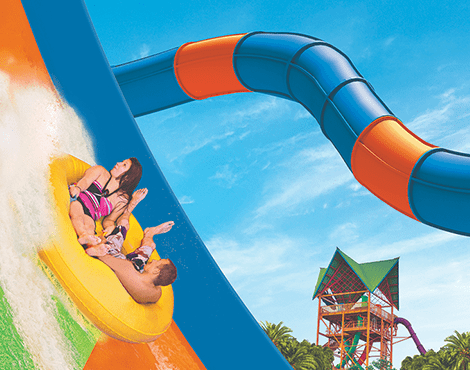 KareKare Curl, Aquatica Orlando’s highly-anticipated new waterslide attraction, will make its grand debut to park guests on Friday 12 April 2019. "KareKare" means "waves" in the Maori language, and combined with "Curl", this new ride could be described as a "curve shaped wave", which riders will experience when surging up the vertical wave wall. True to its name and holding two passengers per raft, this new slide delivers a high-adrenaline, weightless adventure. With the addition of KareKare Curl, Aquatica Orlando becomes the thrill leader among Florida waterparks, with more high-thrill rides than any other. The opening of KareKare Curl signals the second year in a row that Aquatica Orlando has unveiled a new attraction, following the opening of Ray Rush in 2018, a fully-loaded water adventure which combines three unique slide elements into one action-packed attraction the entire family can enjoy together. It was recently named the world’s best new water ride in a USA poll.